Dainese says: The prefect touring waterproof thanks to the extended comfort of a breathable knitted fabric Hi-Vis to EN ISO 20471. 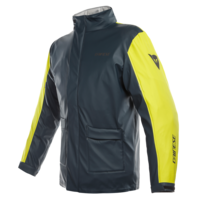 The Storm jacket combines maximum comfort and excellent all weather protection thanks to ultrasonic welded parts with no seams, four way stretch material and coated zip closure. Men’s and women’s versions ensure a great fit. Packable and with an integrated hood, the Storm Jacket is prefect both in the saddle and at destination on tour.